The Tarot Card for July is Strength. Historically, Strength was called Fortitude and in some decks, I've seen it called Lust. Strength is the eighth card of the Major Arcana in Tarot card decks. Strength symbolizes the Sun, the element Fire, and the Leo zodiac sign. Strength represents patience, courage, determination, control, internal peace, and balancing oneself by conquering our animalistic nature. Strength indicates the importance of mind over matter (mental and spiritual strength), and that compassion and understanding may be a better choice that rash decisions and brute strength. This card teaches us to know thyself and temper our primal urges with our more divine, spiritual nature. The Strength card displays a scene where a maiden clothed in white holding the jaws of a lion. Above the maiden's head is the infinity symbol. The lion and the maiden stands upon grass with blue mountains in the background under a golden sky. 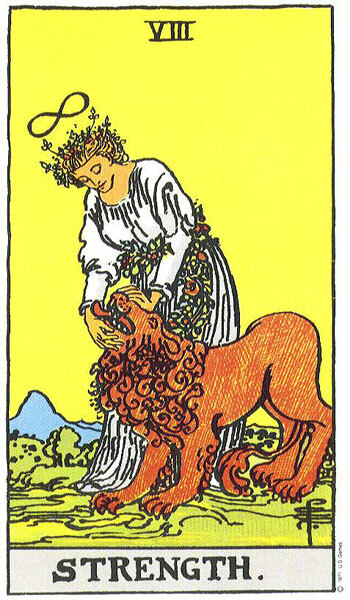 In the context of this card, the lion represents the beast within us, our primal and animal urges and desires; this is not to say that the lion all it represents is negative. The use of a maiden for Strength indicates that it is not about pure physical strength. Both the maiden and lion do not appear aggressive, but represents that internal strength is needed to overcome the beast within. The white robe symbolizes purity. The infinity symbol is said to represent that there is no end to her calm and nurturing character.